A shake is typ­i­cally described as a wooden shin­gle that is made from split logs. When these are used for cov­er­ing the top of a house, the result is a shake roof. Nat­ural wood roof shakes can be very expensive. What are the advan­tages of asphalt shin­gles ver­sus nat­ural wood roof shakes? Cer­tain­Teed man­u­fac­tures pre­mium asphalt roof­ing shin­gles such as Pres­i­den­tial Shake™ that pro­vide the look of cedar roof shakes but with the per­for­mance of fiber glass con­struc­tion. Unlike wood, these roof­ing shin­gles will not rot or decay, and they offer excel­lent wind and fire resis­tance. They typ­i­cally cost a frac­tion of nat­ural wood roof shakes, yet the asphalt roof­ing shin­gles repli­cate the shade, tex­ture and rus­tic design of nat­ural wood roof shakes. 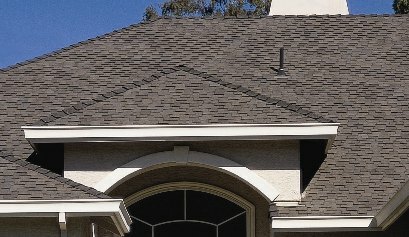 Inde­pen­dence™ is also an asphalt roof­ing shin­gle Cer­tain­Teed man­u­fac­tures to mimic a roof shake appear­ance. It fea­tures a one-piece full-size base shin­gle, ran­dom lam­i­nated tabs and deep shadow lines for a dra­matic, dimen­sional appear­ance sim­i­lar to roof shakes. Asphalt shin­gles designed to look like roof shakes typ­i­cally have improved war­ranty pro­tec­tions as well com­bin­ing aes­thet­ics and design with increased functionality.